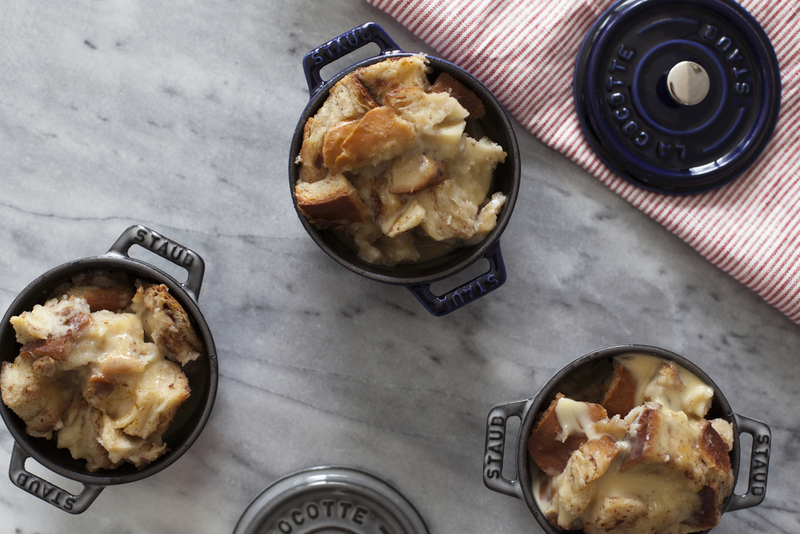 is it too soon for bread pudding? is it more of a winter dish than fall?! whatever. i made a delicious loaf of challah last week & i knew i wanted to make something equally delicious with the left overs. not that there should be left overs when you make a fresh cinnamon roll challah.. but i more so saved it, just so i could make bread pudding. i love bread pudding. partially because bread is my favourite food group & partially because it's such a forgiving dessert, i swear you can throw whatever you want into the mix. i've seen bread pudding made with classic white bread, croissants (yes please), doughnuts (omg yes), assorted pastries & literally any and everything that remotely resembles bread. basically what i am saying is you don't have to use the cinnamon roll challah in the recipe, but i highly recommend it. you can also stir whatever you'd like into the mix; walnuts, pecans, raisins, or even better bourbon soaked raisins. i kept this one simple as i wanted the challah to be the star. it packed enough flavour on it's own & complimented the touch of nutmeg perfectly. for the pudding: preheat oven to 350 degrees. in a large mixing bowl whisk milk, cream, eggs, sugar, vanilla & nutmeg. add the chopped bread & toss to coat. if you are including raisins, add them now. 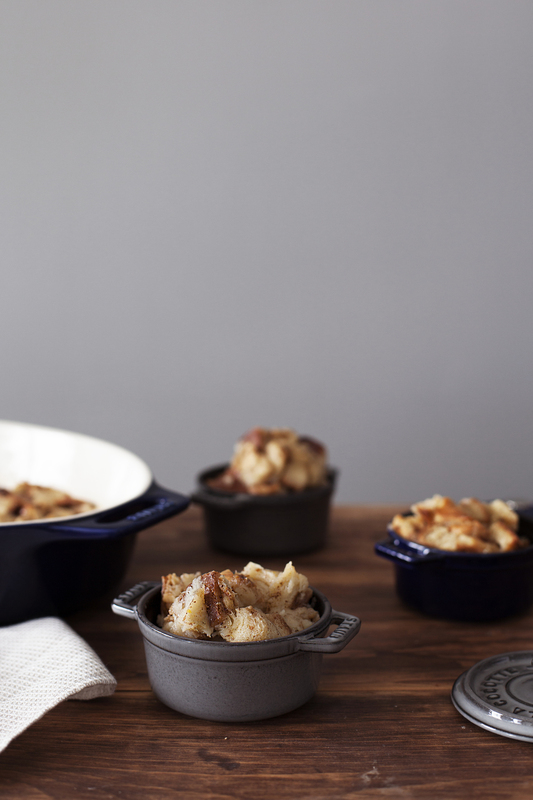 in a greased 9x12 baking dish, evenly disperse the bread mixture & bake for 25-30 minutes. while the pudding is in the oven make the vanilla anglaise. for the anglaise: in a sauce pan over medium heat add cream & vanilla. heat until bubbles begin to form along the edges. in a small bowl whisk egg yolks, sugar, cinnamon & nutmeg. add a tablespoon of the hot milk mixture to the bowl to temper it. slowly pour the yolk mixture back into the sauce pan vigorously stirring (you don't want scrambled eggs!). cook until the mixture coats the back of a spoon & remove from heat. 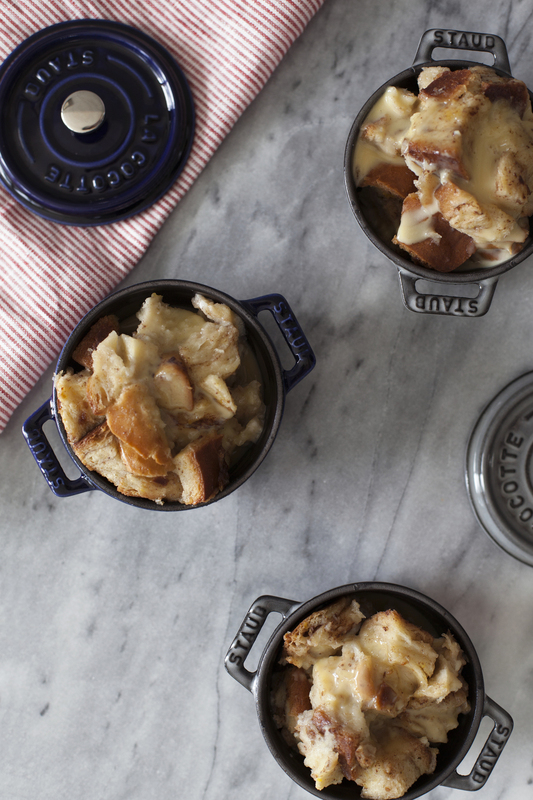 serve bread pudding warm & drizzle generously with the vanilla anglaise sauce.